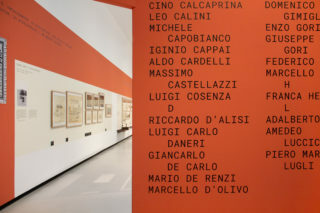 On the occasion of the centennial of the born of Bruno Zevi, MAXXI – Museo nazionale delle arti del XXI secolo and Fondazione Bruno Zevi conceived and organized Gli architetti di Zevi. 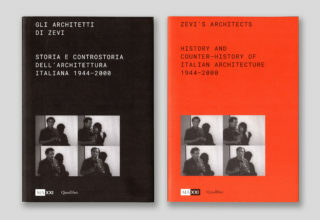 Storia e controstoria dell’architettura italiana 1944–2000 [Zevi’s Architects. 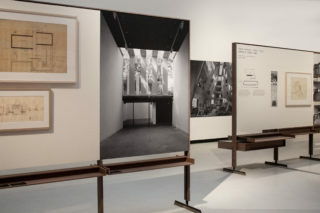 History and counter-history of Italian architecture 1944–2000] an exhibition curated by Pippo Ciorra, Jean-Louis Cohen that aim to investigate the fundamental role of the Italian architect as critic, politician and designer. 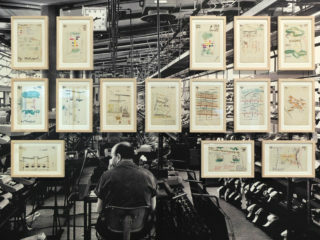 Bruno Zevi was a multitasking figure and the exhibition reflects the complexity of his personality. 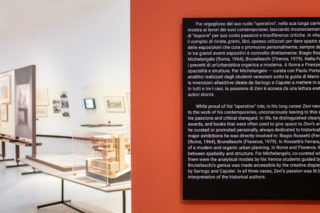 The curators of the exhibition decided to describe this complex character through three parallel, but strictly interlaced, tales. 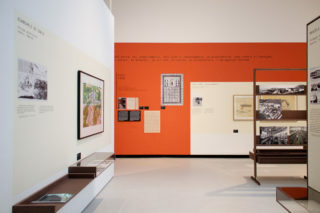 The first level of the exhibition describes the role of the architecture’s critic; through some articles and other writings the curators have chosen a selection of thirty-eight projects and relative designers’ groups of working. 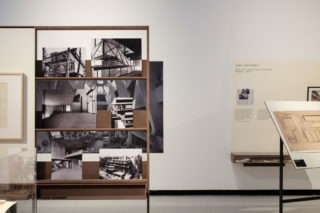 The second level is a huge display system, based on a timeline, which follows the entire exhibition. 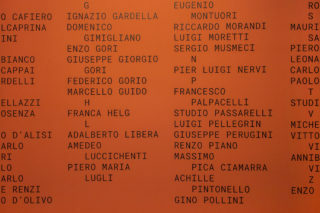 Documents, photographs, articles and other stuffs narrate the life of Bruno Zevi and his active participation in Italian panorama in all aspects. 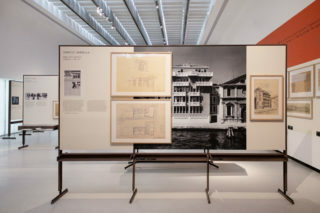 The third level through four focus shows to the visitor that Bruno Zevi was a great architecture’s communicator: Communicating architecture consists in a collection of architecture’s magazine, founded and/or curated by himself, Conceiving the modern city shows the architect’s vision about the relationship between architecture and city planning, Exhibiting history reflects on some Zevian exhibitions and last Zevi against, a section that explore, through his writings, the counter-role of the architect ad his activism. 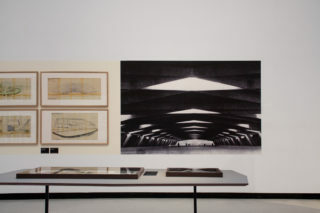 We understood, from the first meeting, the complexity of this exhibition: a choral exhibition about an overview on post-war architects narrated with one single voice, Bruno Zevi’s voice, as third curator. 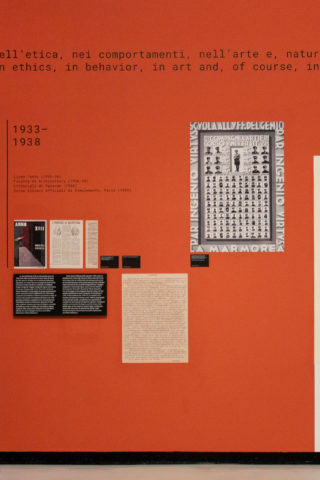 The aim of our graphic design was to give a strong identity to each part but to create a single exhibition course. 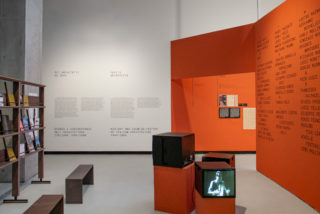 The architect who designed the exhibition conceived a system of modular displays: big artworks means big cabinet with a large display surface. 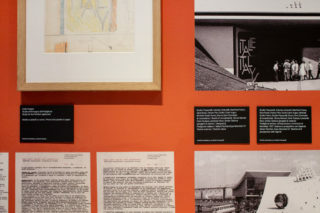 This way to design the exhibition gave to space an interesting sense of movement and recalled in the memory of the visitors a domestic landscape. 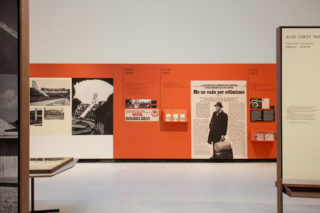 To design the identity of the exhibition we began to think about a very important aspect for us: the role of Bruno Zevi which had in different editorial realities. 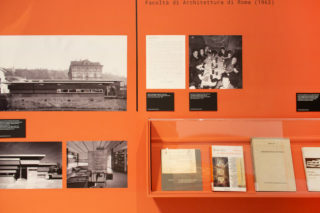 This engagement means that the Italian architect must have a huge archive of papers, as newspapers’ clippings, as writings and other. 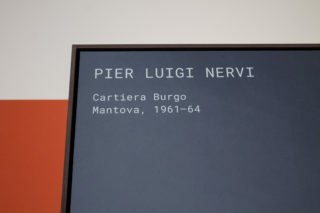 The structures of the exhibition (cabinets) give back the sense of Bruno Zevi’s studio so we selected a mono-spaced typeface that should underline this aspect and bring the imaginary of the visitor specifically to his archive. 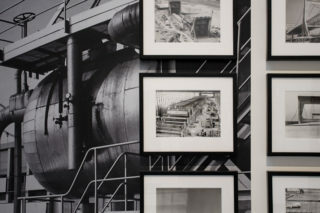 Our approach to the design of the exhibition tries to underline once again the close relationship between Bruno Zevi and printing world. We designed a kind of blank pages that contain the original artworks and placed them on some printed matters like photographs, project’s plan and newspapers’ articles. The visual result is like a broken down book of Zevi’s entire activity. 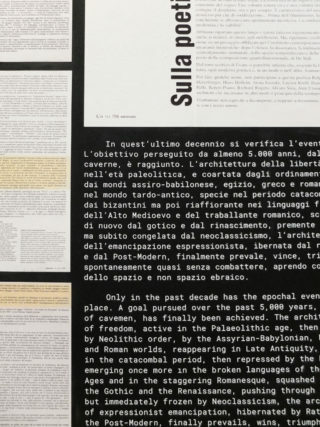 In the timeline about Bruno Zevi’s life our approach was different; all the materials are mixed together to create an homogeneus chronological tale with a random position, but with a studied composition, of the elements in the space: photographs, essay texts, articles dwell together like neighboors in proximity of the package of dates and milestones. 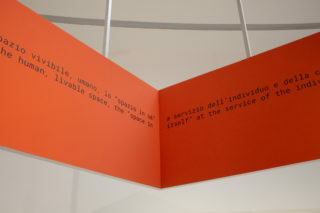 The boundaries of the timeline are well-defined by the orange color, helping us to create a unitarian and clear system. 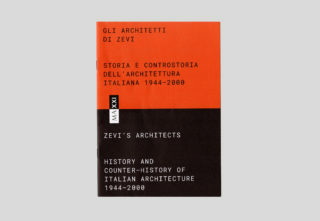 Furthermore we designed the catalog Gli architetti di Zevi. 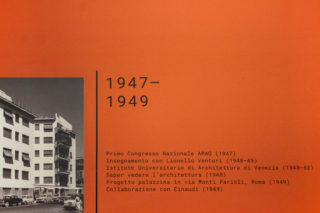 Storia e controstoria dell’architettura italiana 1944–2000.The catalog is edited in two versions (Italian and English languages) with two different covers.